This festival includes route rides, mountain biking, urban riding and BMX along different circuits extending from Tepic to Rincón de Guayabitos, including the Cerro de la Cruz and the Sierra de Vallejo. 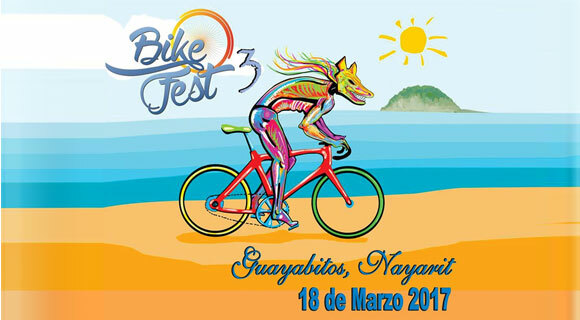 The third edition of the Riviera Nayarit Guayabitos Bike Fest is preparing to head out from March 17-19, 2017. This event offers not only rides but also plenty of competition for those who like to put their mettle to the test. It all starts on Friday at 5 p.m. with an urban ride that will pass through La Peñita de Jaltemba, Rincón de Guayabitos and Los Ayala. At the end the Federal Police will offer a chat on the topic of bikes as a means of transportation in order to address the riders’ right of way issues, mobility, rights and obligations. On Saturday at 6 p.m. there will be two simultaneous competitions. One is a cycling route for 112 km between Tepic and Guayabitos; within this route there will be an 18 km race against the clock between the villages El Llano and Platanitos. The other race on Saturday is a mountain bike race from Playa de Los Ayala to the Sierra de Vallejo and back, to complete 50 km. There will be a social event at the close of both races where there will be food available, live music and contests. Afterwards a BMX trial exhibition will be held around 3 p.m.
About 250 competitors and their families and friends are expected to attend. To date there are participants confirmed from León, Guadalajara, Aguascalientes, Puerto Vallarta, Mazatlán, Tepic and several other destinations along the Riviera Nayarit. Registration cost is $350 pesos for riders and includes a t-shirt, snacks, mechanical support, sweeper and other services. For registration information and questions please contact Alejandro Haro at 045 (311) 847 3640. More details at https://www.facebook.com/BikeFestNayarit/?fref=ts.